Presented By: Routes Bicycle Tours & Rentals, Inc.
Join our expert local guides as we make the sacred, powerful, and visually stunning pilgrimage from Santa Fe to Chimayó! This experience is a true cultural kaleidoscope and encompasses everything from Downtown Santa Fe (circa 1610) to traditional Native American Pueblo orchards/fields (never officially part of the United States), and the unique high desert canyons, vistas, and “Badlands” north of Nambé Pueblo. 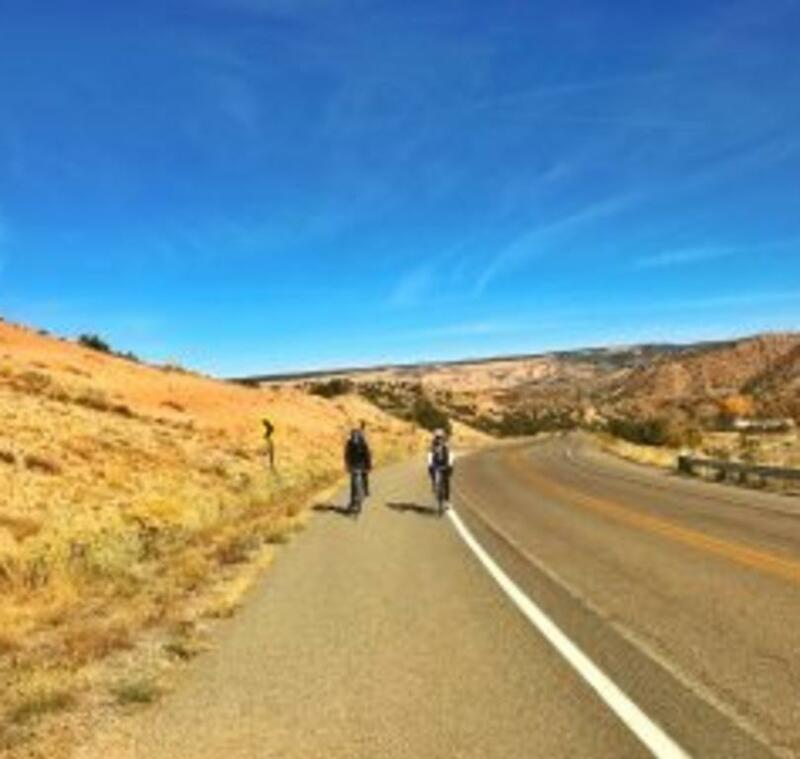 There is no comparison to the experience of powering yourself (and becoming one with yourself) outdoors AND ON A BICYCLE through the ancient landscapes and cultures of New Mexico. After arriving in Chimayó, you’ll step into a universe steeped in local tradition, culinary arts, craftsmanship, and in which anything is possible. Routes is proud and humbled to be the first and only tour operator to offer this sacred and transformative personal experience by bicycle. Our intimate journey begins in the grand Santa Fe Ballroom at the historic La Fonda On the Plaza Hotel over an included healthy continental-style breakfast and a custom warm-up yoga/stretch session. 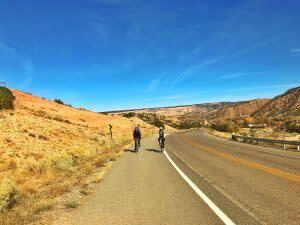 We’ll depart Downtown Santa Fe and pedal 28 miles north along the famous High Road to Taos to the Santuario de Chimayó. In Chimayó we’ll tour the amazing Santuario & have some time for personal reflection/offerings, meet local artisans who have lived in the area for generations, and taste the heirloom red & green chiles for which Northern New Mexico is famous. We’ll enjoy a delicious New Mexican lunch at the famous Rancho de Chimayó Restaurant (and a bit of free time) before returning to Santa Fe by-bike through the beautiful and sacred landscapes of the Nambe and Tesuque Pueblos. This tour is a sacred, all-faith, and a very personal physical experience. All guests are invited to bring candles to light, personal items representing hardship or affliction, or other relevant items/tokens to offer at El Santuario. Bringing a small container with which to capture & take sand from El Pocito is also encouraged (containers are available for purchase on-site). Our group will spend 25-30 minutes of self-guided personal time on the sacred chapel grounds. Before saying goodbye and continuing our own personal journeys, we’ll cap our experience with an optional smoked craft beer tasting and appetizer social at the Chili Line Brewery and Restaurant in Downtown Santa Fe. Difficulty Level: Intermediate/Advanced. Riders should be comfortable with a longer-distance bicycle ride alongside vehicles, and at higher elevations with grade-changes (a support-and-gear vehicle is available).